Here at the Doctor Yum Project, we are always looking for ways to make things simple and healthy. One of the easiest and most delicious ways to prepare vegetables, and keep them heart healthy, is to roast them. Something really magical happens when you allow the vegetables to cook in just a small amount of healthy fat, on a cookie sheet at medium temperature. The vegetables cook slowly, allowing the natural sugars in them to caramelize. The edges get brown and crispy, and the insides are cooked perfectly. Is your mouth watering yet? 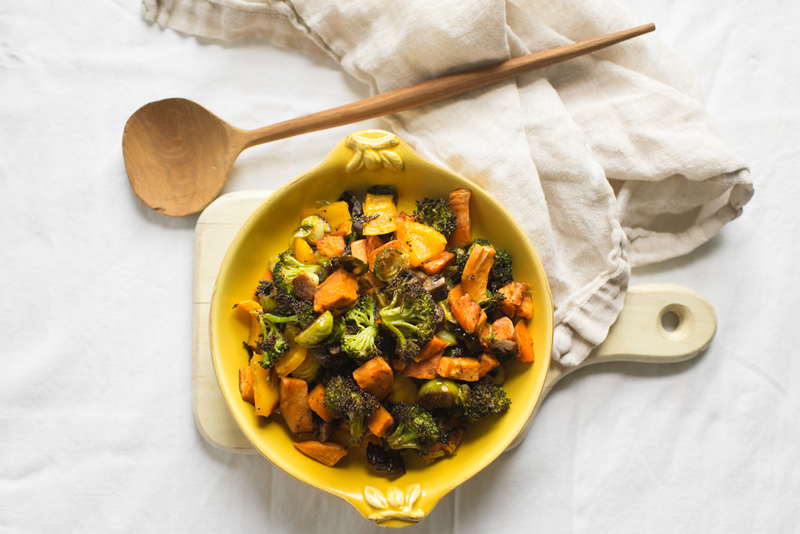 Adding roasted vegetables can be a delicious part of a heart-healthy diet! Save some for lunch or breakfast the next day! olive oil, grapeseed oil or coconut, about 2 tablespoons per 4 cups of veggies or enough to lightly coat the veggies. You can cut up 2-3 cups of vegetables and add 2-3 tablespoons of fat. Make sure to melt the coconut oil first if it is solid. If you are using grapeseed oil, you need less. If roasting with olive oil, heat the oven to a maximum of 350 degrees. The same temperature works for the grapeseed oil and coconut oil as well. Toss the cut vegetables in the oil, spread on the cookie sheet and add your seasonings. Every 15-20 minutes you will want to stir the vegetables and remove those that are finished cooking. Thinner vegetables like asparagus will crisp quickly while big chunks of sweet potatoes, and juicy vegetables like squash and tomatoes will take longer. It will be worth the wait, we promise! Plan on allowing the vegetables to roast for approximately an hour, but that will vary depending on the vegetables you choose. Roast as many cups as you need for as many meals and snacks as you need.